World recognised as a marlin fishing Captain on the Great Barrier Reef Capt Trent Visscher’s proven results and passionate dedication to marlin fishing along with tournament wins and world record captures have made Trent one of the young guns on the Great Barrier Reef highly rating him as an outstanding Captain in the Cairns Fleet . Trent began game fishing at the age of eleven in the Swansea area in NSW, Australia aboard his own boat, 6m Haines Hunter, Wild Child. Trent has fished all over Australia, as well as Vanuatu and Nauru. In the last 15 years Trent has focused his career in the Cairns area, fishing for Giant Black Marlin from September to December each year, before returning home to Newcastle for the Port Stephens/Newcastle Marlin season from December to April. 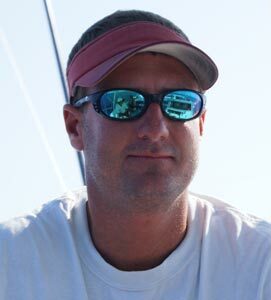 His extensive knowledge and experience of the Giant Black Marlin Fishing grounds of the Ribbon Reefs off Cairns on the Great Barrier Reef have enabled Trent to provide his clients with consistent proven results each Cairns Season. Unfortunately Trent couldn’t fish the 2008 Cairns Giant Black Marlin Season due to a life threatening illness but he is back for the 2009 Cairns Season and is keen to achieve his consistent results again this season. Keep up to date with his results each day during the season on our blog. Early in his career working as a deckhand on world renowned game fishing boats, wiring and gaffing many giant black marlin over 1000lb, the biggest being 1389lb, has given Trent the edge as one of Australia’s top marlin fishing Captains. During the Port Stephens/Newcastle season from December to April Trent is also recognised internationally due to his involvement in world record captures on both ultra light tackle and fly tackle. His knowledge of the Port Stephens/Newcastle fishing grounds is extensive having started fishing at the age of 11. This knowledge and experience of these grounds has seen Trent win several marlin fishing tournaments from this world class fishing destination.